A Quilting Chick: Grand Illusion Top Finished! Every single time I look at these pictures, I fall in love with this quilt all over again. 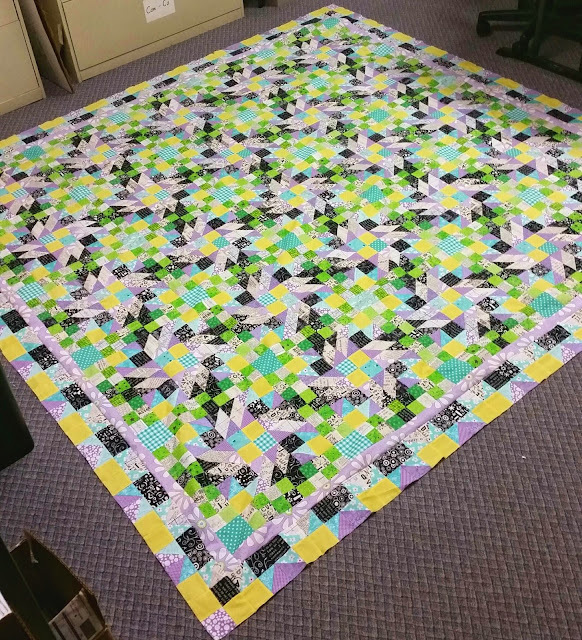 Last night I finished up the flimsy of my Grand Illusion Mystery designed and hosted by Bonnie Hunter of Quiltville fame. I loved all the steps as they were released. Then the big reveal at New Year's and my love chilled. A lot. This is by far the busiest quilt I've ever put together. So I set it aside and let it marinate. A while. Earlier this month, I felt ready to work on it again. I'd seen other people's versions and slowly fallen back in love with it. And now that it is finished, I do truly adore it. Cassidy came out to look at it when it was finished last night and claimed it. Which is funny, because when the reveal came out, she was in the same boat I was. I think a lot of our love for this quilt comes from the fabric choices and color choices I made. I made sure to go with crisp colors, very sharp. I toned down the yellow just a tad by using the lavender in the border. I just love every tiny piece of this one!!! I'm so, so happy to have it done. 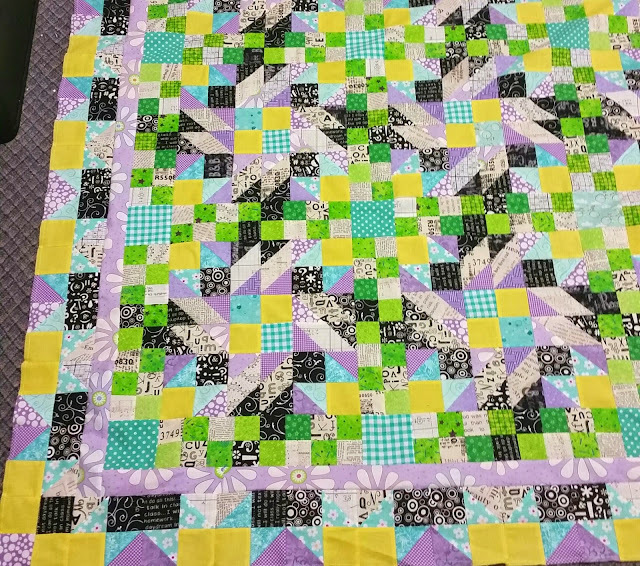 Today I'm linking up with Fabric Tuesday at Quilt Story, Show and Tell Tuesday at I Have to Say, WIP Wednesday at Freshly Pieced, and Let's Bee Social at Sew Fresh Quilts. Also with Crazy Mom Quilts! Your quilt top is lovely! Hey, I finished by GI Quilt top last night too!! Whoop Whoop! I also pieced the backing, so it's all ready to put on the long arm rails today. Hurray! This quilt has been a long time coming with the lag I also experienced when the mystery was revealed because it was so busy, plus other projects getting bumped ahead of it. Great flimsy finish! Beautiful quilt! A lot of small pieces, I'm sure it was a labor of love (^_^). I love the colors in your quilt. I'm not a purple person but this is beautiful and very springy! I am SO GLAD you got that one done. Now we just have to get them quilted. I want to get a top basted this month and it might be the Grand Illusion. It might also be a top for my mom. We shall see. Oh. My. GOODNESS! So big and so beautiful! Congratulations on this finished top! Great job, great quilt top! It's beautiful, I find I just want to stare and stare and each time I see something new!